Here is part duex of the Balancing Rock Garden found on the Buzz Around Hamburg Garden Walk. 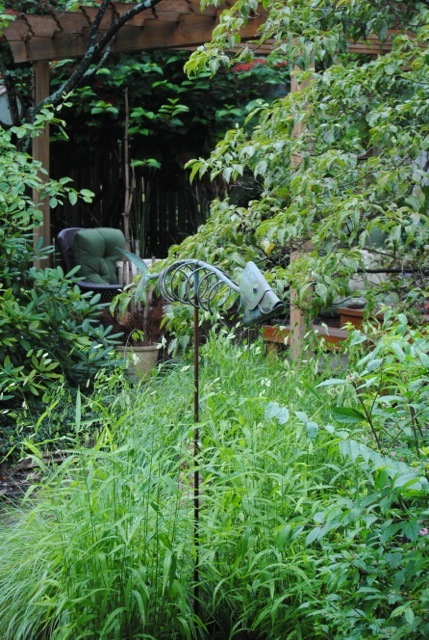 The previous part show was off to the side of the house, this part of the garden was (is) directly behind the house, visible from the home itself. 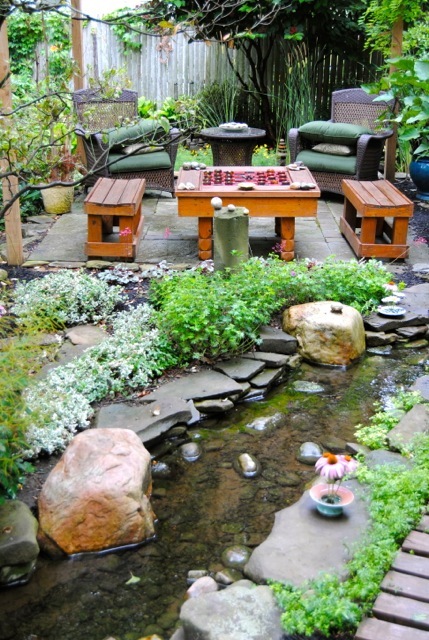 Two ponds with a stream between, with a path around and patio/pergola combo make up the structure of the back yard. And there's plenty of balanced rock work here too, but it doesn't take precedence here. 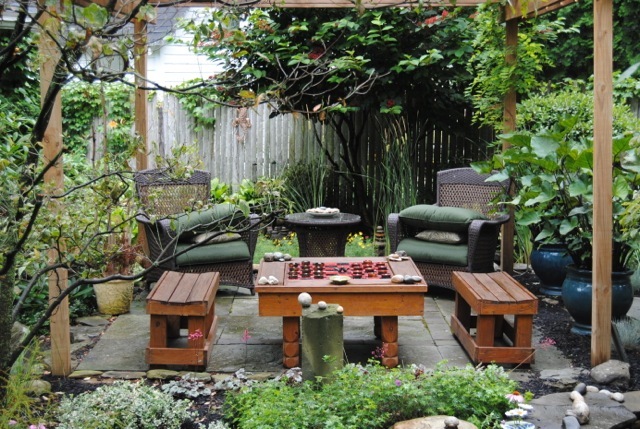 This is one garden I'd love to be able to share an overhead view of their space planning because with two ponds, path and pergola laced on an angle, the space management and great nooks for planting beds really makes this a super personal and special garden. Never been in one like it before (and I've been in a LOT of gardens!). 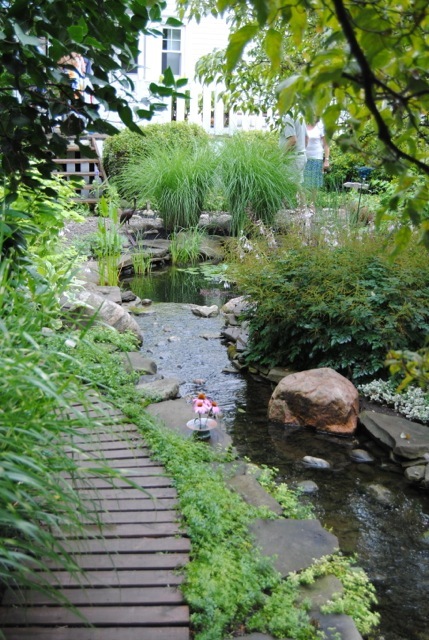 This was on of the nicer gardens I found on the Hamburg tour - though I didn't see anywhere near even half of them. 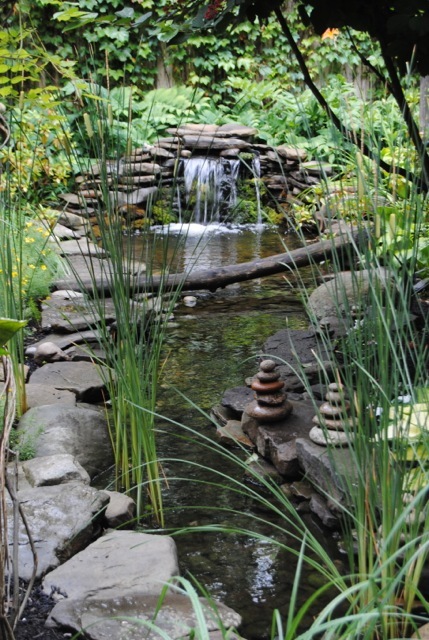 Seen from the house, you cannot see the pond with the waterfall and just get a tease of the pergola. Looking from house into yard. 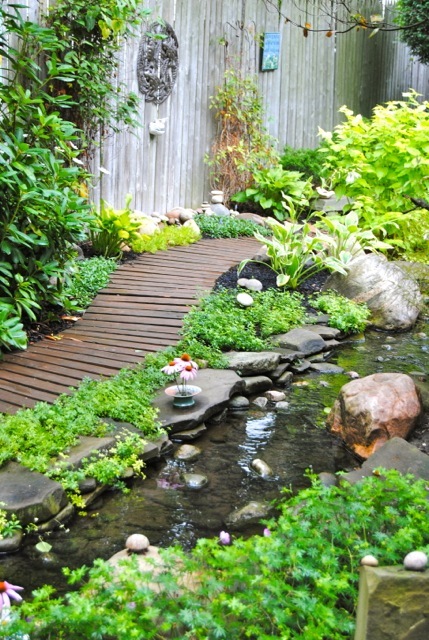 A path around the creek in teak gets you a peek at the pergola and waterfall pond. 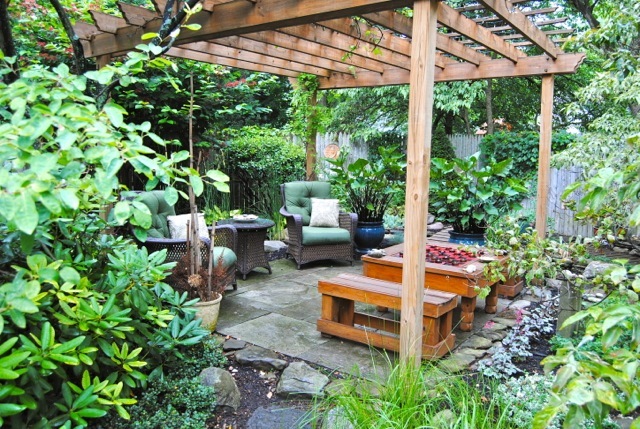 The pretty pergola (and a few balanced stones) looks quite inviting. Another angle on the pergola. Nice, no? Looking back on the teak path. You can hear the waterfall before you can see it, though the stacked rocks are quiet. 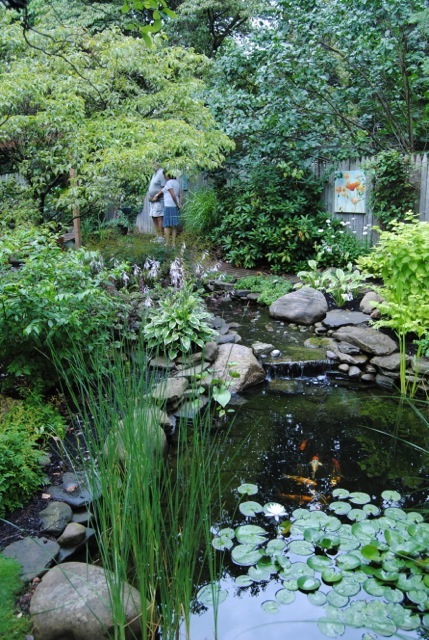 No pond is complete without a fish. oh how tranquil and natural this stream is!! 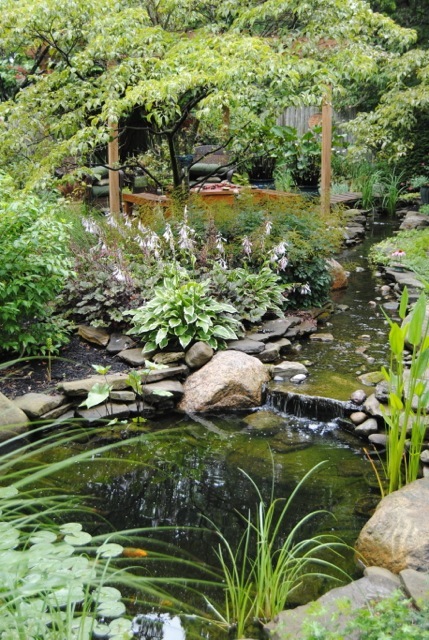 It was a great stream and ponds on each end is a brilliant idea. 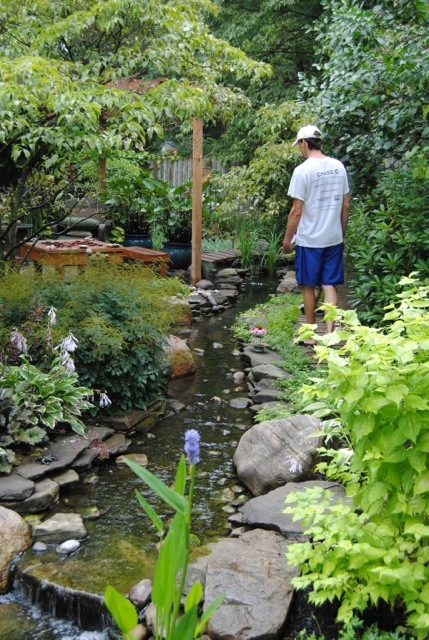 I don't want a pond, but if I did, a creek would certainly be involved. I grew up across the street from a creek and would love to add a feature like that, if I had the room.